There was a huge housing shortage in the United States after World War II as GIs returned home. Lustron houses were designed to help with this housing need. These unique homes were manufactured in a former airplane factory and made of prefabricated enameled steel. 2948 Lustron houses were constructed between 1948 and 1950. The average sales price was $10,500. These homes were made in four colors: Surf Blue, Maize Yellow, Dove Gray, and Desert Tan. The interiors were modern, with an emphasis on efficiency and space saving. For instance, there were built-in wall units in the bedroom and living room. The interior walls, ceilings, and kitchen cabinets were all made of enameled steel. Home owners had to hang pictures up with magnets! The sound quality inside was different because they were made of metal. 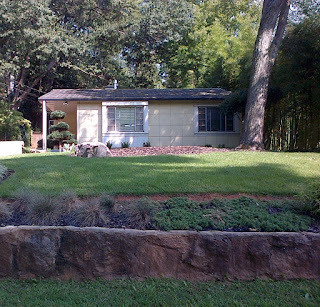 The ranch homes were available in two- and three-bedroom models. The Lustron company went bankrupt in 1950 because of production delays and distribution problems. 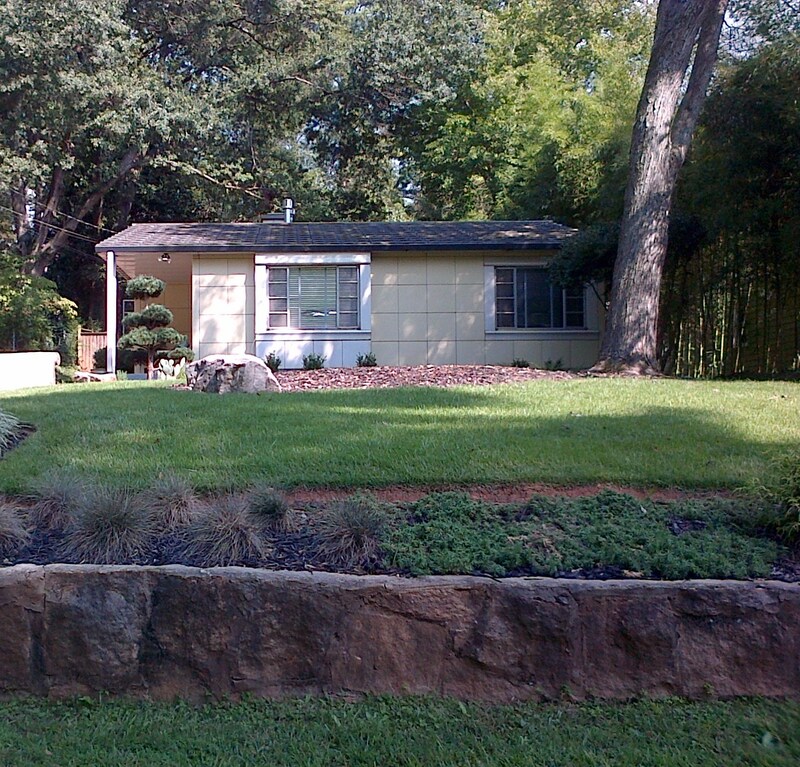 There are about 2000 Lustron homes still in existence, and they are treasures. One of my friends, who is an architect, found one in the Atlanta area. 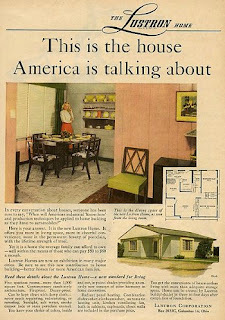 We drove to see it and I was very taken with the house - and the story behind Lustron homes. You can find a listing of Lustron homes on Wikipedia: Lustron homes in the United States. Great resource on Lustron preservation from the Ohio Historical Society. Interesting story with photos and a detailed PDF about a Lustron house in Arlington, Virginia that was disassembled and moved to the Ohio Historical Society for display - The story of Lustron House #549. Have you seen one of these homes? Would you enjoy living in one? I'd love to hear from you in the comments, below. How interesting - it's amazing to think so many have survived, considering they were probably intended to be temporary. Here in the UK we had pre-fabricated housing after the war and I'm sure some of those still survive too. Interesting post! These are a part of history that we have forgotten about. They got a lot of publicity at first, but the costs were too close to building a regular house, and the traditional building materials became more available. The people who live in them are extremely dedicated to their preservation. I have never been inside one, but hope to see one someday. Yes, this is a very interesting post. It was worth downloading the pdf document. I had never heard of this type of housing. How interesting! I haven't heard of this before! Thanks for sharing this! We lived near Midland/Odessa - oil field area and read similar accounts of homes that were put together and looked very similar in boxy style. I have yet to be a homeowner, but I always lean for something more tidy and compact with lots of outside living! So, yes definitely this functional design is for me. As they say "they don't make things like they used to" -- oldie but goodie. Thanks so much for visiting! I enjoyed reading your comments. There are several other Lustron homes in this area that I haven't seen yet. Now I want to seek them out. If I do, I'll post more pics. I find the whole Lustron story fascinating!